The day’s action on the auxiliary field opened with a 5-0 victory for the Alberta Grizzly over the Washington Blue Sox. Losing pitcher Gen Utamura of the Blue Sox gave up four earned runs over the course of three innings, and it began when Ryan MacCarrick came around to score on a single by Wesley Brown in the second inning. Mike Hardin and Wesley Jones kept things going for the Grizzly in the third inning by reaching base on a walk and a double, respectively. After consecutive RBI groundouts from Bill Pearson and Brook Clark, MacCarrick stepped up to the plate and hit a solo home run to make it a 4-0 game after three innings. The scoring concluded in the sixth inning when Ryan Whitt’s RBI single drove home Clark, who led off with a walk and made the score 5-0 in favor of the Grizzly. Winning pitcher Jensen Kirch threw a gem for Alberta, only giving up three hits over six innings (two to Blue Sox batter Ken Nakajima), while fanning five batters. The top two teams in the standings both lost on the stadium field on Saturday. First, the Manitoba North Stars snapped their three game slide by winning 2-1, handing the Oregon Lumberjacks their first loss. The North Stars scored the game’s first run in the fourth on a passed ball. Nick Campana provided Manitoba with insurance in the top of the seventh by hitting a solo home run, his third of the year. In the bottom half, the Lumberjacks cut the deficit in half when Trevor Westmoreland reached on a fielder’s choice to drive in Reinaldo Gonzalez. With the bases loaded and two-outs, Thomas Wordell got Jordan Hill to fly out to end the game. Ryan Gowens, the Manitoba starter, allowed five hits and a walk over five scoreless innings with seven strikeouts. Michael Stryffeler took the loss, but allowed just an unearned run on five hits over six innings. He also struck out nine. Campana finished the day 2-for-3 with a solo home run and stolen base. The Canada A’s and New York Colonials entertained the crowd with a close contest during the second auxiliary field game of the day, which eventually saw the A’s defeat the Colonials 2-1. Canada was paced by starting pitcher Kevin Grendell, who continued his masterful 2019 CWL campaign with four innings of shutout ball and ten strikeouts, giving up a lone hit to Jake Luce to lead off the game. Tyler Pfeffer got things rolling for the A’s in the first inning when he reached on a single then scored when Joseph Becht lined a double into the outfield. The Colonials tied the game 1-1 in the fifth inning when Kamal Muhammad hustled to third base on an error and then scored two batters later courtesy of Jacob Colombo’s sacrifice fly to center field. The A’s stormed back in the sixth, after Becht singled and later scored to make it 2-1. The Colonials fought until their last at-bat, but with Armett Johnson representing the tying run at third, A’s closing pitcher Andrew Chin induced a groundout to end the game. Becht’s two hits and a run scored led the A’s on the day, while Johnson and Luce’s singles were the only two hits for the Colonials. In the second game on the stadium field, the Palm Springs Chill rode the momentum from a big second inning, and defeated the Toronto Rush 6-1. The Chill sent nine to the plate in the bottom of the second, and scored five times. Jimmy Lunardelli reached on an error to start the inning, then went first-to-third on a Taylor Olmstead double. Nico Garbella drove in the first run with a sacrifice fly. Two-out run-scoring singles from Brian Pozos and Evan Weidner extended the Chill lead to 3-0. A Greg Saenz two-run double capped off the inning’s scoring. The Rush got on the scoreboard for the first time in the fourth. Grady Caldwell hit a one-out double, moved to third on a ground-out, and scored on a two-out single from T.J. Ward. 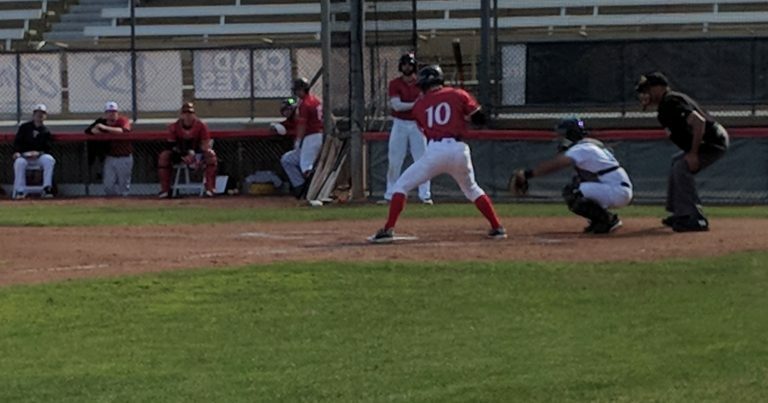 Palm Springs got the run right back in their half of the fourth, when Nicholas Mira drove in Pozos with a one-out single. Donnie Speranza earned the win for the Chill after allowing four hits and a run over four innings. Bozos and Mira both finished with two hits and an RBI apiece. Pozos scored twice while Mira scored once. Sunday at the California Winter League is Senior Sunday. Every senior 65 years or older with a valid ID gets in for just $5. Game one at the stadium features the Alberta Grizzly @ the Oregon Lumberjacks at 10 AM, followed by the Manitoba North Stars @ the Palm Springs Power at 12:30 PM.